Welcome to Part Three of my in-depth look at the new Ninja Mega Kitchen System. Instead of one super long review, I decided to break up the review and create a variety of items that use all aspects of the system to really “kick the tires,” so to speak. I have made plenty of nut butters in the Ninja Professional blender (most popular: peanut butter) so, today I sought out to make something I haven’t made before: Cashew Butter. And, to make it even more complex, I used raw cashews. This would also provide a fairly decent comparison between making nut butter in the 72 ounce blender jar (all I had before) to using the smaller, more food processor-type jar that comes with the Ninja Mega KS. For this project, I made sure to use the 24 ounce “mini prep” bowl, so I could give that a good shake-down. 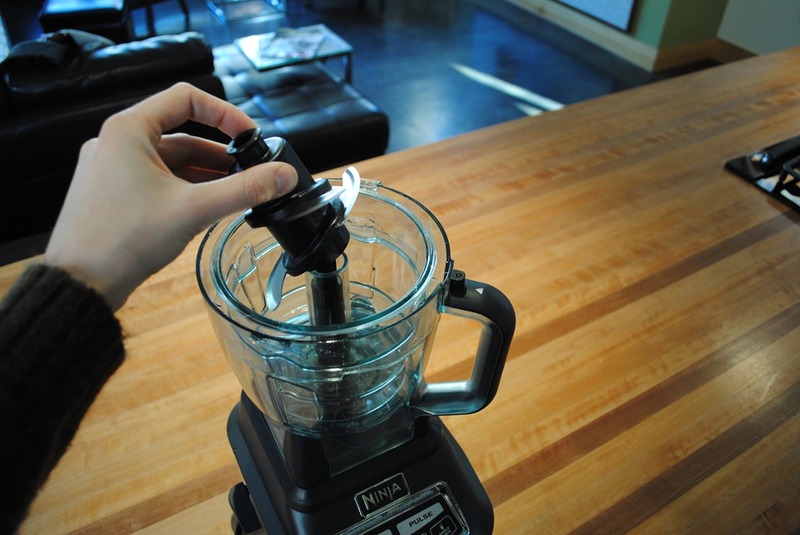 I have to say, making nut butter is faster – by a lot – in the Ninja Mega with the food processor blade/jar. Of course, some of this is to do with I was using cashews, which are a bit of a softer nut. I also think some of it is due to the blade design (closer together blades) and the smaller volume of the jar. Here’s a little tutorial on how I went from raw cashews to creamy cashew butter in less than 90 seconds. (82 seconds, to be exact). 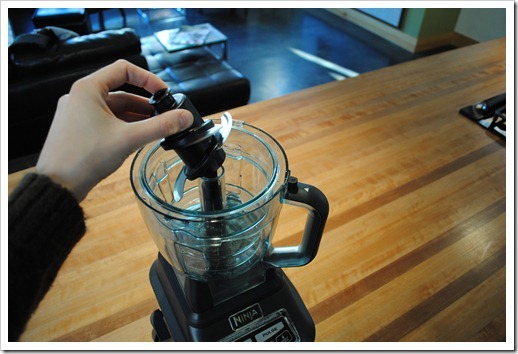 If you want to do this with a food processor or Ninja Professional or Ninja KS, just follow the steps with what you have available! 1. 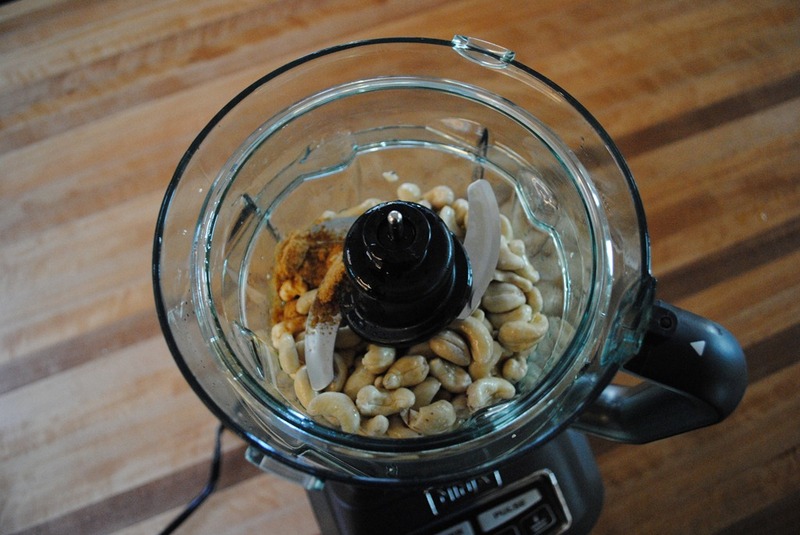 Soak cashews. This step is optional, to be honest. But, since I was working with raw cashews, I went ahead and soaked them for a couple hours in the morning so they would be ready when I wanted to blend in the afternoon. 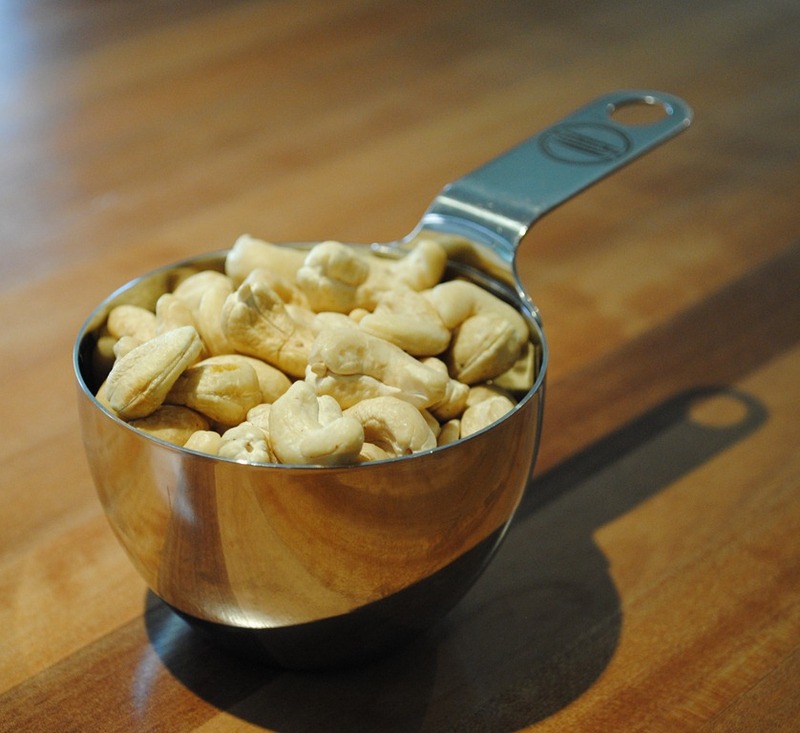 Simply put one cup of cashews in a small bowl, cover with water, and walk away. 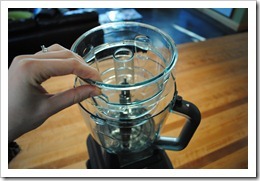 If you are doubling or tripling the recipe, skip this step and just use the 64 ounce bowl and blade. Place the 64 ounce bowl on the base and insert the plastic spindle. Place the blade for the 24 ounce bowl over the shaft, again, making sure it is seated well – you should see all of the metal portion of the shaft once it’s inserted. If you don’t, wiggle it around to get it seated. If you’re not sure, do a test fit with the lid before you add your ingredients. 3. 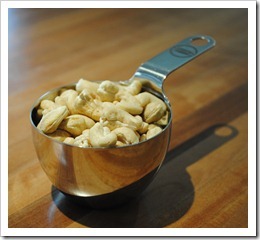 Add Ingredients (1 cup cashews, 1 tablespoon oil, 1 teaspoon sweetener). Note the fully visible metal portion of the shaft! This is critical to making sure the lid will lock. 4. Pulse to combine, then blend on “2” (Blend) for about 90 seconds, or less, until you get a consistency you like. The key is to use speed “2″ and no higher. Blending on “3” does not make it go faster and doesn’t get you a creamy result. Trust me, I tried this speed first and had one batch that didn’t come together at all. Want to see it in action? I made a short video that picks up about halfway into the blending, to save you the madness of watching the whole thing. It is not a good video, but it is a video nonetheless! I left the volume true to how it really sounds so you can get a feel for loudness. Why are you timing and filming? I just read your neat website. I found it quite informative and thank you for providing an option to leave a message. I actually have a question. I am thinking of buying the Ninja Mega KS but was wondering if you’ve experienced something. I presently have a Vitamix, and it pulverizes the fruits and vegetables just fine, but it also always heats up the produce in the canister which is why Vitamix is able to makes soups right in the canister but I don’t want my juicing to be heated. Does the Ninja Mega KS heat up your juicing the longer you operate the machine? This is the main reason I don’t like juicing in my Vitamix. I also love the fact that you get both a blender and food processor with the NMKS. And thank you for providing the nut butter recipes! Glad you find the site helpful! 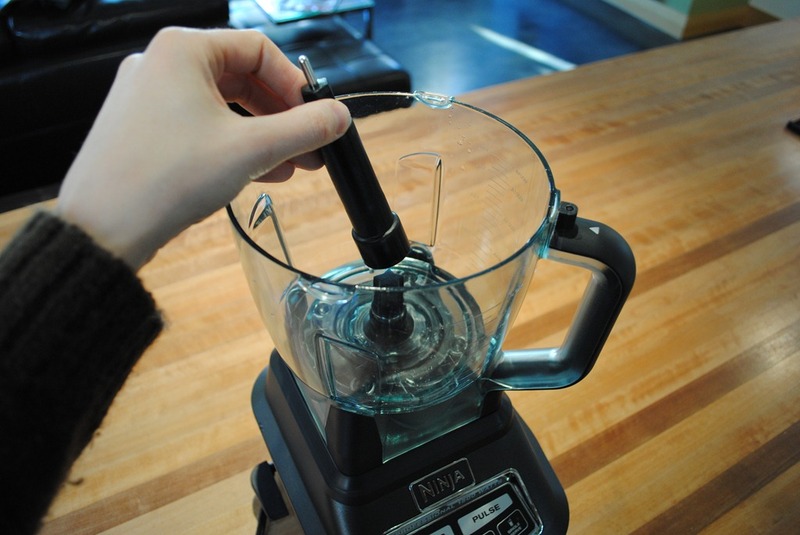 The Ninja blenders do not heat up the produce in the canisters (none of them do this). So, you can make whole food juices just fine without the contents becoming heated. I was wondering which model of the ninja you used in this. Mine has the more square shaped containers and has failed so far to butterize any nut besides peanuts! It works marvelously for that but it can’t handle almonds, cashews, or seed butters like sunflower. I believe mine is the kitchen system 1100 – any tips on getting these other nuts into butter with it? I used the Ninja Mega Kitchen System, but have made cashew cheese (similar to cashew butter) in the Ninja Professional 1100. I used the old square ninja to make almond butter. You have to blend it for about 20 minutes and scrape the sides often. Can I use the single cups to make nut butter using sunflower seeds? I only want to make 1 cup at a time and this system has the larger bowl. Yes, I think you can, with a caveat. I’ll write up a post on this for next week. The single serve cups are more than capable of making nut butter, but you may find it kind of annoying do to the screwing/unscrewing of the blade that you might have to do in the process. I’ll be the tester here and will make a batch over the weekend with step-by-step and publish next week. Stay tuned! 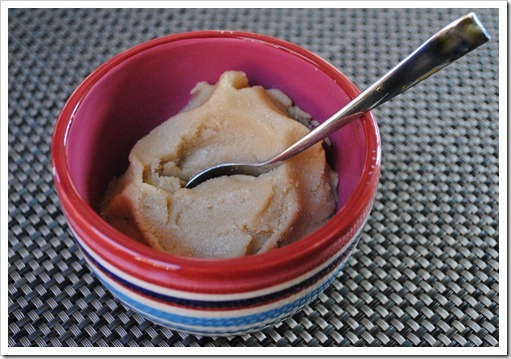 I was wondering about making jut butters in a Ninja 1500 watt blender. Not sure if it’s the Mega. I read some reviews that they overheat. As a daily use blender/smoothie maker, do you recommend it? I want a Vitamix, but need a blender that I don’t have to save up to purchase. Purchasing nut butter is expensive, and I prefer making it. Oh yes, this is absolutely doable and it does not overheat. Go with a ratio of 1 cup nuts to 1 tablespoon oil. For the 72 ounce pitcher, you’ll want at least 2 cups of nuts as it does better with volume. Pulse to begin to combine, then blend on 2, scraping the sides down as needed. Hard nuts like almonds take a while, but soft nuts like peanuts blend very quickly. The Ninja Kitchen System is absolutely the WORST for making any type of nut butters or doughy textured concoctions. It overheats very repaidly and stops working until it cools. This means it takes an hour to make 1.5 cups of almonds into almond butter ( it should take less than 10 minutes). If your are thinking about getting this thing, DON’T. The frustration will make you insane! This is surprising, as I have never had an issue! It takes me about 90 seconds to make cashew butter and 10 minutes to make almond butter. I wonder if you have a defective unit? You may want to reach out to the Ninja folks and see if they will send you a replacement — that definitely doesn’t sound right! i am having the same issue. and i soaked the almond skinned them and dehydrated them! getting so frustrated! i think i actually cooked the butter. it was steaming each time i opened it. i did try peanut butter and it did do what they claim in about 3 minutes. why are almonds so hard?? I am in the process of purchasing this machine can you advise if it is really worth the money or the time? I have purchased other machines in the past and was not satisfied. A real one waste of money. I really like and it use it daily, from single serve smoothies, to food processing, to blending in the large jar. It is different than other blenders though, and with that comes pros and cons. Check out my review and hopefully that will help. Just purchase The Ninja Kitchen Pulse which I’m not sure if you’re familiar with since your review has been just for the Mega Ninja Kitchen System which is more powerful than the Kitchen Pulse. I am confuse as to which model Ninja to get, I chose the above mentioned unit because it was cheaper than the other models which states it function as a blender and a food processor. I would like your opinion on this particular model b/4 I actually start to use it whether you think it’s worth the trouble or not to use it. It is a 700 power unit. I quite like the Pulse, but it truly depends on what you want it for. It is perfectly fine as a blender and food processor, and more powerful than most standard blenders/food processors. However, if you do a lot of blending and need a bigger volume container, you probably would be better off with the Mega KS. Hopefully that above review will help. I too have a question regarding which model (The Pulse vs. 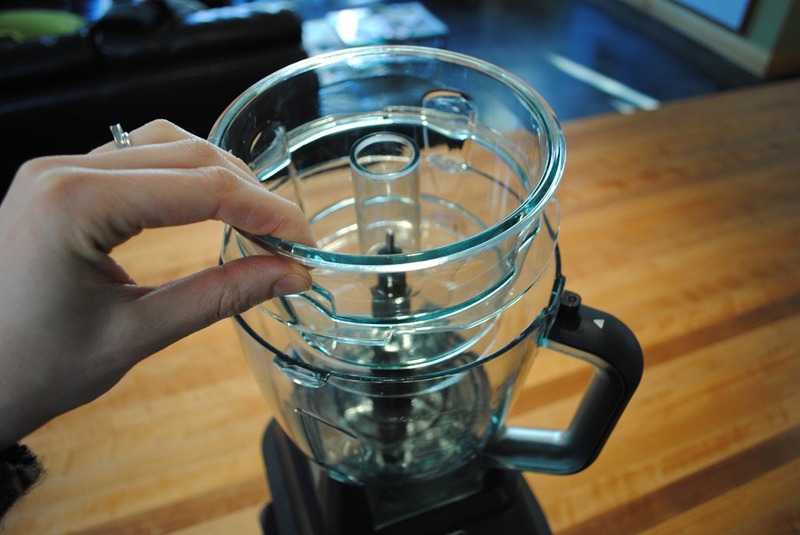 The Professional Blender vs. just a separate processor unit) would be best and read your review on the Pulse. You mentioned there that multiple speeds are needed for nut butters, so it might be better to buy the Ninja Professional Blender. The thing is that I don’t plan to make large batches of food, and don’t have a lot of kitchen space, and the pulse is much cheaper. I want something that makes super creamy hummus, homemade falafel, smoothies, lara bars, and nut butters, and was hopeful that the pulse would fit my needs, except that you said multiple speeds might be needed. I have almost burned out my black and decker blender making hazelnut butter and just use it for smoothies now since it has been an awesome blender up until I started trying to blend nuts in it. Would the Ninja Pulse be sufficient to make creamy nut butters and lara bars? Or is it best to just purchase a food processor or the separately for nut butters? If I could see a video or pictures of the Ninja Pulse making nut butters and lara bars, it would really help me to make a purchase decision. I just have to wonder now, how important is the multiple speed function for multi purpose uses? 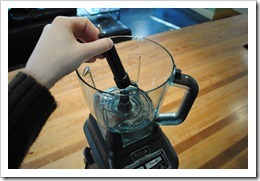 The Pulse is much more powerful than a “normal” blender, so it is quite sufficient for most things. You can make hummus, falafel, smoothies, and lara bars no problem with it because of the design of the blade that goes through the middle, not at the bottom like a normal blender. You can also make some nut butters – from the softer nuts like peanuts, cashews, and walnuts – but it is going to struggle with almonds and probably hazelnuts because they are so hard they take a long, long time to blend. You can get around this by soaking the nuts overnight to soften them up. For people that don’t have a lot of space and don’t need to make lots of volume, I generally recommend the Pulse. I gave one to my mother in law and she loves it. I rotate between using the Pulse and the Ninja Mega and try to share recipes that use either/or to show that the Pulse is quite competent. Just last night I made strawberry soft serve in my Pulse because we don’t have a dishwasher and I didn’t want to clean the larger pitcher. Thanks so much Angela. That definitely makes me feel better about the Pulse’s capability to blend nut butters and I too don’t have a dishwasher so it sounds like it would be a better purchase for me. 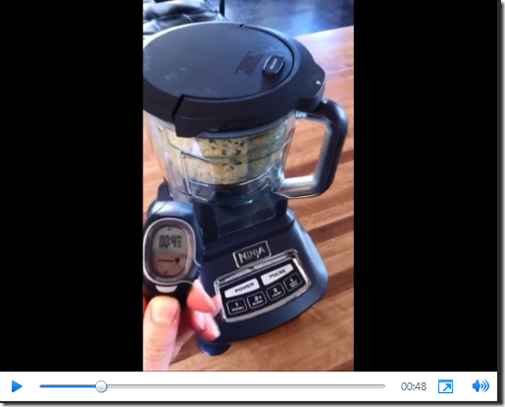 I really appreciate your thorough response and the link to the recipe using the pulse. Hi! Can you make nut butters without adding extra oil? Thanks! You definitely can, with the exception probably of almond butter. Almonds are just so hard that they need the oil. If you need a little help getting the nuts moving towards butter, you can just use a splash (small) of water a little at a time until you get it blending into butter. 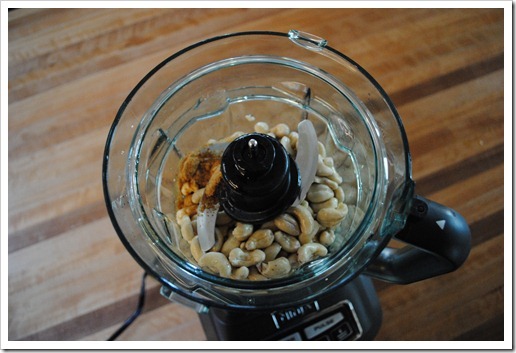 You’ll have to experiment here, but, it is definitely doable, and I have done it many times with peanuts and cashews! Now I am confused on the almond butter. Everything thing I have read on making them says not to soak them, unless you fully dehydrate before making butter. Everything I have read says the almonds will take a while to release their own oil but will do it. You can roast them ahead of time, for like 6 mins and it help release the oils quicker. I know it can take like 15mins to release the oil. I know for making almond milk you want to soak them for like 12hrs. Just confused as this is the first time I have seen to soak them. Do you find this makes the almond butter wetter? There are certainly several ways to do this! I have read both ways, and both have their pros and cons. Some people don’t believe in roasting nuts, others do. Nevertheless, almond butter is definitely the most difficult nut butter to make because almonds are so hard. Before I had a dehydrator, I just soaked them and dried at room temperature, which seemed to make them easier to blend, but it still took 12-15 minutes. This doesn’t make the almond butter watery. However, if you have a dehydrator, it certainly will not hurt to dehydrate them, as they will become a bit richer in flavor. I will confess to the fact that we’re remodeling our house right now and I don’t have a kitchen, so, I have been kind of lazy lately and buying it already made (shame!). I don’t know if I helped with your question or not, but the point is that you can do it any number of ways, depending on your preferences! Thanks for the reply…..I have another question. 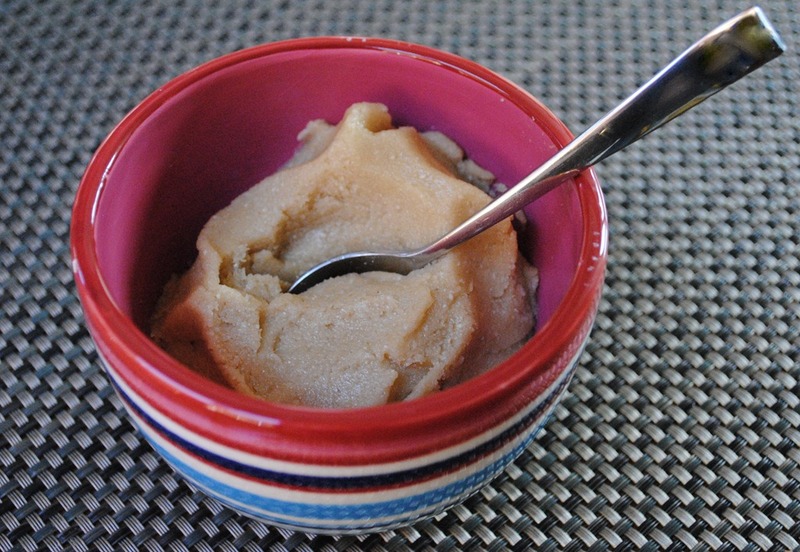 Have you ever made coconut butter? I made it in my old processor and it took a bit, but it was nice a creamy. I tried it in the ninja processor bowl and I can’t get it beyond gritty, even with adding extra coconut oil. The base was getting quite warm. I had also made some coconut milk and the pulp in the blender jar was more the consistency of what I was looking for. I am going to give it a try in the blender, as soon as my family is done watching their movie, but do you have any thoughts on what might be the reason I can’t get it smooth in the bowl? Hoping the pitcher will work better. I have had the exact same experience as you when trying to make coconut butter. There are lots of good thoughts in the comments of that post – hope it helps! Did you try the blender? I’m curious how that came out. I did try the blender and it didn’t work any better….but I am thinking it was due to the fact I was using sweetened flakes and not unsweetened. It was “ok” once it set, just not creamy like butter, but still not bad. My hubby liked it, my daughter said it was ok, but liked the first batch I made better, although she continued to eat her jar of the new stuff 😉 I am going to give it a whirl again with unsweetened flakes next time I buy them and do some in the ninja(and maybe use the dough blade) and some in my black and decker food processor and see which works better. In the mean time the “ruined” batch will be blended with a couple cups of water and make into coconut cream. I think I will chill it and make it like a coolwhip or something. And I will throw some into my protein shakes, so all is not lost. Just takes practice too I guess. About Almond Butter. I have made large quantities. I blanch the almonds, remove the skins, then blend without any additional oil. Drop into boiling water for 3-5 minutes, until skins are VERY loose. Remove from water, and douse with cold water until almonds are cool to the touch. Pinch the almonds (time consuming) to remove the skins which should just “scoot” off easily. If not, you didn’t blanch enough. If some small skin part remains, no big deal at all. This raw hulled almond butter is delicious, and is not roasted, and contains none of the bitters in the almond skin. I have not used this system for it, but I have made many pounds of almond butter. Brilliant suggestion, thank you very much, Richard! Ok I did it! Made coconut butter with the Ninja mega kitchen system food processor bowl. I do not have the mini-bowl insert thing, only the large one. I had killed my regular food processor when trying to make almond butter, but it was kind of on its last leg anyway 😉 I thought I would have to go buy a regular food processor even though I have my ninja, so I did do that and took it back because it was so loud! I tried it in my regular blender and it didn’t work. Anyway I decided I had to give it another go. I put the dough blades in the food processor and just worked it on the dough setting. It took a bit, but it started getting liquidy! It was great. Still a bit grainy, but you kind of get the same thing with peanut butter or almond butter too. I did use about 2tsp of coconut oil which helped some. Then I sweetened with honey, which always seems to mess it up! So then I have to add more oil, but I had that problem with my regular food processor too so I think I just need to find a different time to add the honey or something. But it works!